Over the weekend, Warner Brothers invited members of the press to the London set of Justice League. In doing so, the studio made some major reveals and offered some of the first information regarding the film. On of those revelations regarded Cyborg’s appearance in the ensemble film. Ray Fisher’s character will be almost entirely CGI in the movie. Costume designer Michael Wilkinson revealed designs for the Cyborg character, which were almost entirely chrome, with lights coming from Cyborg’s chest and eye. One design even featured a weaponized Cyborg with an extra arm soaring into battle alongside Wonder Woman above a Batmobile being flipped by Parademons. 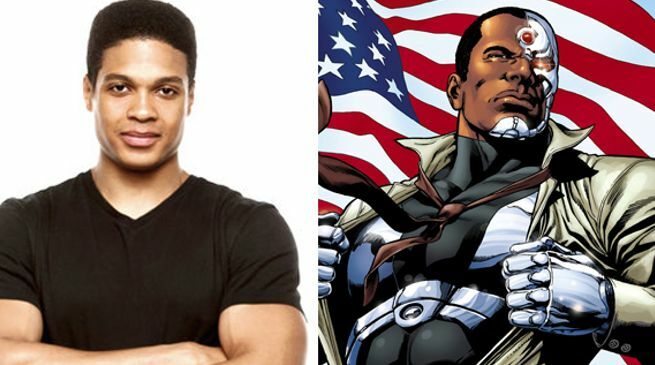 However, the only part of Ray Fisher we will really see in Justice League is his face. On set, Fisher wears a motion capture suit with different color legs and markings along his limbs. It almost looks like Robbie Amell’s Firestorm suit, complete with an orange light over Fisher’s chest and one over his eye. In post-production, these lights will serve as parts of his body but on set they shine light onto set pieces and other characters as Cyborg’s body would were it actually there. We will also see Cyborg blending into the world by wearing civilian clothing. Concept art in the costume design area showed the character wearing a sweatshirt with a hood on and more casual pants. While Fisher’s motion capture suit is likely the easiest of all the Justice Leaguers costumes to put on, he’ll probably still appreciate the days in civilian gear. For a complete rundown of the Justice League costumes revealed by Warner Brothers over the weekend, click here!